Singapore Optics shop retail laser optics & fiber optical components covering the entire spectrum from UV to FIR. 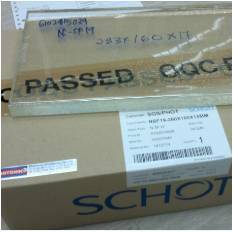 Introduction: Schott D 263 is a low alkali borosilicate glass that is produced by melting the purest raw materials. As such, it is very resistant to chemical attack. D 263, with its specific properties and large range of different thicknesses with tight tolerances, is exceptionally well suited for a number of applications including: liquid crystal displays, optoelectronics, touch control panels, sensors, electroluminescent displays and solar cells. Due to a special down draw production process, D 263 glass sheets are marked by fire-polished surfaces; this glass type can be used without ground and polished surfaces. well-known B 270™ crown glass in sheet glass form.This is the improved version of sola-lime glass, ultra-wite. Introduction: Schott material, N-SF19, 667331.290.